Kenmore's 100th Anniversary Event with Chef Kari Karch PLUS an Exciting Contest Announcement! 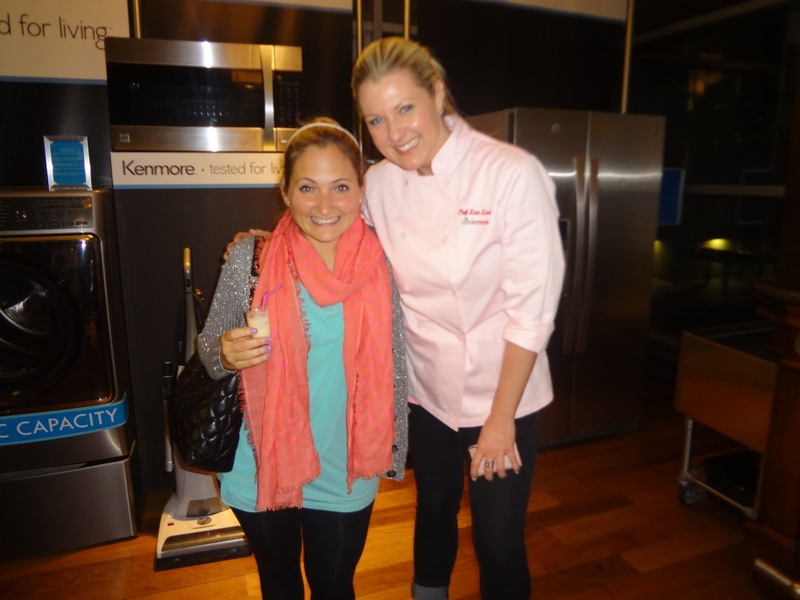 In honor of their 100th Anniversary milestone this year, Kenmore is celebrating with events all over the country, including one where they showcased 100 years of appliances at the MPE Penthouse in Midtown West. The space was transformed to look like a cross between a time warp and a travel version of their Kenmore test kitchen in Chicago. Guests were either treated to a signature Vanilla Bean & Pear Cocktail, with vodka, pear, nectar, vanilla bean and lime or red and white wine as they perused the merchandise, old and new. The devices that stood at the most were the double oven range with precision cooking and refrigerator that was almost as big as my bedroom! Both were used during the cooking demo. 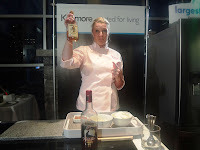 Kenmore had Kari Karch, their In-House Chef and Host of the cooking videos on their YouTube channel, on hand to show attendees some simple recipes they could do at home, preferably on their Kenmore appliances. Kari began with a simple appetizer, Asparagus and Edamame Hummus with Garlic-Rubbed Crostini, a recipe that is very simple to make and perfect combination for summer. Next, with the help of someone from the audience, Kari prepared her take on a Chicken Milanese. The dish looked more difficult to make than it was. It was perfectly crunchy and citrusy at the the same time. Lastly, a Banana Fosters Milkshake was introduced, a recipe that Kari came up with during a recent vacation. Her anecdotes in between the cooking demos made the experience feel like a best friend that was cooking for you on a weekend night in with the girls. Kenmore also introduced their newest website called, Cookmore, a project they began to provide their customers and fans something more than just appliances. Anyone can post recipes to the website, create digital cookbooks, and share recipes with family and friends. To show appreciation to U.S. servicemen and women in uniform during the Memorial Day Weekend Celebrations-by the Intrepid, Kenmore is offering hundreds of special taste-of-home breakfasts to those who serve, which is where you come in! Kenmore is inviting home cooks across the country to submit their favorite homestyle breakfast recipe on cookmore.com by May 3rd for the chance to win great prizes. Top recipes will be served at the event by a celebrity chef. Recipe entries also have a chance to be featured in the Kenmore 100th Anniversary cookbook, due out this fall. The grand prize winning recipe entry, chosen by Service Men and Women, will win a 3-day 2-night foodcation (valued at $3,400)! Visit cookmore.com to enter. For each entry Kenmore will automatically donate $5 to Heroes at Home to support military service members, veterans, and their families. For more information on Kenmore appliances, please visit: http://www.kenmore.com.